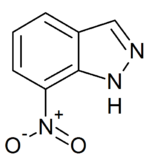 7-Nitroindazole, or 7-NI, is a heterocyclic small molecule containing an indazole ring that has been nitrated at the 7 position. Nitroindazole acts as a selective inhibitor for neuronal nitric oxide synthase, a hemoprotein enzyme that, in neuronal tissue, converts arginine to citrulline and nitric oxide (NO). Nitric oxide can diffuse through the plasma membrane into neighbouring cells, allowing cell signalling, so nitroindazole indirectly inhibits this signalling process. Other inhibitors exist such as 3-bromo-7-nitroindazole, which is more potent but less specific, or NPA (N-propyl-L-arginine), which acts on a different site. 7-Nitroindazole is under investigation as a possible protective agent against nerve damage caused by excitotoxicity or neurodegenerative diseases. It may act by reducing oxidative stress or by decreasing the amount of peroxynitrite formed in these tissues. These effects are related to the inhibition of type 1 nitric oxide synthase. However, anticonvulsive effect is derived from some other mechanisms. ^ a b Southan GJ; Szabó C (February 1996). "Selective pharmacological inhibition of distinct nitric oxide synthase isoforms". Biochem. Pharmacol. 51 (4): 383–94. doi:10.1016/0006-2952(95)02099-3. PMID 8619882. ^ Moore PK; Wallace P; Gaffen Z; Hart SL; Babbedge RC (September 1993). "Characterization of the novel nitric oxide synthase inhibitor 7-nitro indazole and related indazoles: antinociceptive and cardiovascular effects". Br. J. Pharmacol. 110 (1): 219–24. doi:10.1111/j.1476-5381.1993.tb13795.x. PMC 2175981. PMID 7693278. ^ Babbedge RC; Bland-Ward PA; Hart SL; Moore PK (September 1993). "Inhibition of rat cerebellar nitric oxide synthase by 7-nitro indazole and related substituted indazoles". Br. J. Pharmacol. 110 (1): 225–8. doi:10.1111/j.1476-5381.1993.tb13796.x. PMC 2175991. PMID 7693279. ^ Moore PK; Babbedge RC; Wallace P; Gaffen ZA; Hart SL (February 1993). "7-Nitro indazole, an inhibitor of nitric oxide synthase, exhibits anti-nociceptive activity in the mouse without increasing blood pressure". Br. J. Pharmacol. 108 (2): 296–7. doi:10.1111/j.1476-5381.1993.tb12798.x. PMC 1907983. PMID 7680591. ^ Gammie SC; Olaghere-da Silva UB; Nelson RJ (July 2000). "3-bromo-7-nitroindazole, a neuronal nitric oxide synthase inhibitor, impairs maternal aggression and citrulline immunoreactivity in prairie voles". Brain Res. 870 (1–2): 80–6. doi:10.1016/S0006-8993(00)02404-5. PMID 10869504. ^ Kampf C; Roomans GM (May 2001). "Effects of hypochlorite on cultured respiratory epithelial cells". Free Radic. Res. 34 (5): 499–511. doi:10.1080/10715760100300441. PMID 11378533. ^ Schulz JB; Matthews RT; Klockgether T; Dichgans J; Beal MF (September 1997). "The role of mitochondrial dysfunction and neuronal nitric oxide in animal models of neurodegenerative diseases". Mol. Cell. Biochem. 174 (1–2): 193–7. doi:10.1023/A:1006852306789. PMID 9309687. ^ Matsumura, N.; Kikuchi-Utsumi, K.; Nakaki, T. (2008). "Activities of 7-nitroindazole and 1-(2-(trifluoromethylphenyl)-imidazole independent of neuronal nitric-oxide synthase inhibition". J Pharmacol Exp Ther. 325 (2): 357–62. doi:10.1124/jpet.107.135160. PMID 18270316. This page was last edited on 8 October 2018, at 17:50 (UTC).